Margaret Tudor is one of the most unknown of Tudor characters. She would not gain fame like her sister Mary , who would become well – known for her beauty and exploit in France with Charles Brandon, or Henry, her brother who would become infamous as Henry VIII. Margaret was the oldest daughter of Henry VII and Elizabeth of York. Born on November 28, 1489, Margaret’s birth was greeted with mild acclamation. Margaret was promised to James IV of Scotland in 1502, and they married in 1503. Margaret would have six children with James. Sadly, only one would survive infancy. In 1513, at the Battle of Flodden Field, Margaret’s husband died. Not yet 24, she became regent for her young son, James V. The conditions of her regency were that she remains a widow. But Margaret would not waste on the rocks of Scotland a sober and sad widow. She married Archibald Douglas, 6th Earl of Angus, on August 6, 1514. However, her marriage also ended her regency. Rule of Scotland turned over to John Stewart, second Duke of Albany. John Stewart was the closest male in line to the throne after, of course, the King. When Albany became regent, he had also to take custody of Margaret’s two surviving children, James and Alexander. After some small resistance, she relented and gave up James and his brother. Margaret was weary of Scotland. Her new husband was just as bad as Angus, only poorer. She began seeking another divorce. So sick of Scotland was she that she ran away, but was intercepted and brought back to Edinburgh. 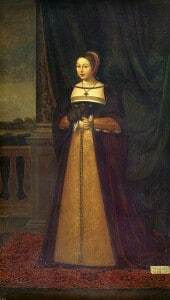 Margaret died of a severe stroke on October 18, 1541. Her last wish was that all her belongings go to her daughter. For much of her life, tragedy was followed by intrigue. The lure of Margaret Tudor lies in her obscurity. Margaret lived a life just as full, and just as tumultuous as Henry, and definitely more so than her sister Mary. Margaret organized a coup, married half as many people as her brother, and was always thirsting for power. This queen goes down in the history books as one of the most formidable women in Scottish history, along with her daughter –in- law, Mary of Guise. The life of this remarkable woman who flouted convention and destroyed tradition is one of the best historical treats. This entirely Tudor, Tudor.